The red work is made up of the flags of all 54 countries that currently form the continent of Africa. 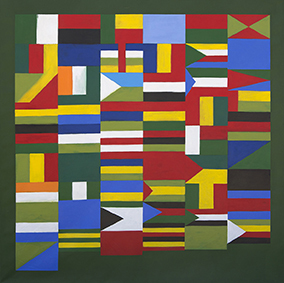 The green work is made up of the colours of the flags with insignia removed. The yellow ochre work is made up of traditional cloth designs painted in place of the colours of the flags. These works call to attention the fact that colonial powers imposed borders and boundaries upon the face of Africa, dividing tribes and separating traditional homelands to create new nations. 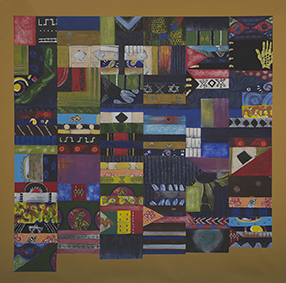 The set of three works attempt to de-colonize Africa by removing the insignia and imposed borders and replacing them with the traditional patterns of an older order.